The BA310Elite model introduces superior improvements both in optical and mechanical performance. 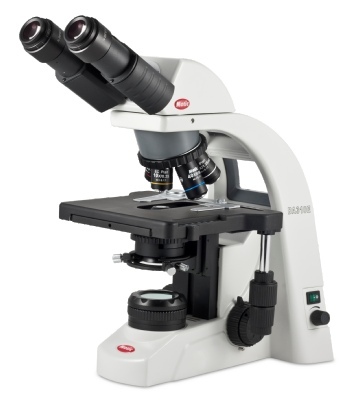 The model now incorporates a lead-free manufacturing process in accordance with current RoHS standards, and follows the optical features and performance derived from the flagship model BA 410. 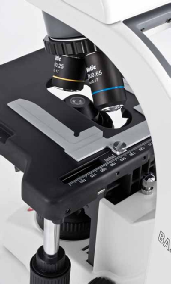 The new rackless stage enables a convenient movement of the x/y stage without prominent gear rack interference; while a new specimen holder design gives a soft but solid grip to the glass slides. For full freedom of Illumination options, the new model has a complete and easy interchangeability of its 6V/30W Halogen bulb with LED modules and has full koehler illumination. Motic’s new generation of EC Plan Achromat objectives sets a new price-performance standard in optical quality. With excellent spherical aberration correction to significantly improve field flatness and resolution, the EC optics offer superior colour fidelity through new multi-layer coated lenses. The importance of LEDs for safe and long-term illumination has increasingly become the norm in educational and clinical microscopy environments. Experienced users may still prefer the “warm” Halogen illumination so to cover this situation, the BA310Elite has full interchangeability between its Halogen and LED light sources. Coming with a standard 6V/30W Halogen bulb, the lamp socket also accepts a new LED module,and the choice of two different colour temperatures, (4500K, 6000K) enhances illumination options in a user-friendly way. A new BA310Epi-LED FL scope has been added to the family and uses LED technology as an excitation source without the drawbacks of conventional HBO illumination. Instant illumination readiness of the system without the need of lamp alignment and easy intensity control of the Fluorescence excitation are key advantages. See here.